Randy Staub, one of the world’s most noted rock producers. The breathtaking acoustics of the massive room at Vancouver’s world-famous The Warehouse Studio. Mint condition drums, tuned to perfection. All recorded using the best dynamic, ribbon and condenser mics money can buy, through chains of rare vintage outboard and finally saturated by one of the only three existing Neve AIR consoles. Add all that and you have The Rock Warehouse SDX – a drum sample recording firmly grounded in the roots and fundamentals of rock but that goes above and beyond any genre or convention. Simply put: drums, recorded with utmost craftsmanship in one of the finest facilities in the world. 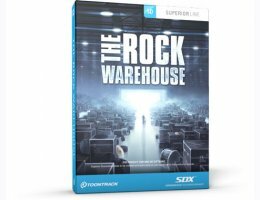 The Rock Warehouse SDX comes with a broad scope of drum selections and presents a total of three full kits, two extra kicks, three additional snares and an extensive collection of cymbals. From the modern edge of the Ayotte Custom kit, the warm and round sound of the Gretsch USA Custom set to the massive strike of the Dunnett Titanium drums, your options span from tight and snappy to big and ambient. The recording was engineered and produced by Randy Staub. With mixing credits on some of the best selling rock albums ever (Metallica‘s "Black Album", Nickelback‘s "Silver Side Up", Avril Lavigne‘s "Under My Skin") and a catalogue that spans close to 300 productions, he is undoubtedly one of the most prolific and noted producers of the past decades. Add to that the touch and feel of sampling drummer Ryan Vikedal (ex-Nickelback) and the result is undeniable.